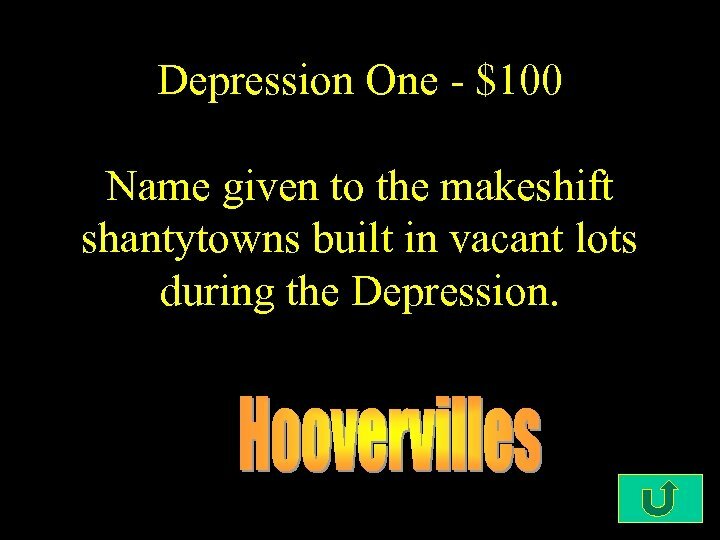 Depression One - $100 Name given to the makeshift shantytowns built in vacant lots during the Depression. 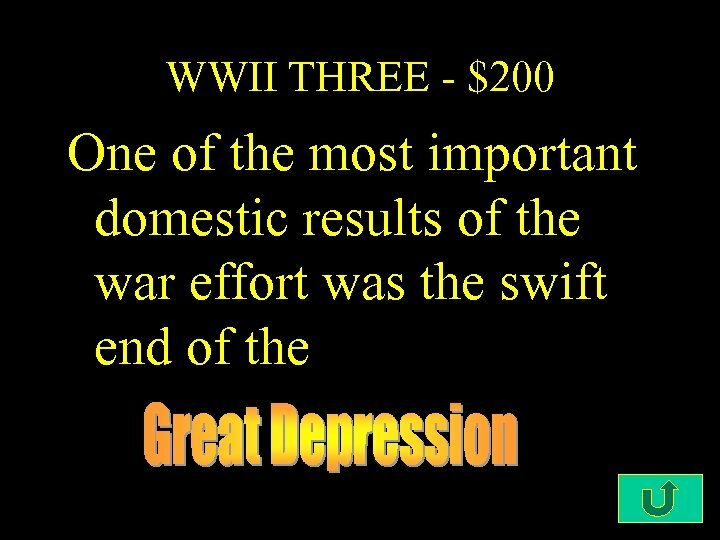 Depression One - $200 Facing the financial crisis of the Depression, WW I veterans tried to pressure Congress to pay them their retirement bonuses early. 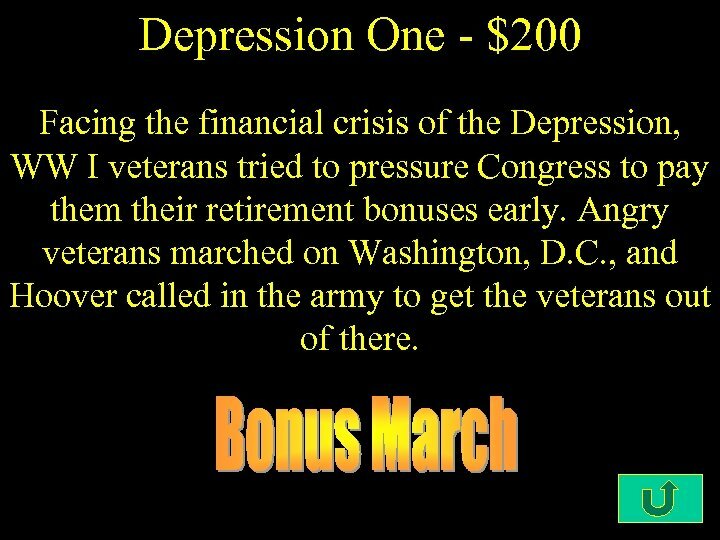 Angry veterans marched on Washington, D. C. , and Hoover called in the army to get the veterans out of there. 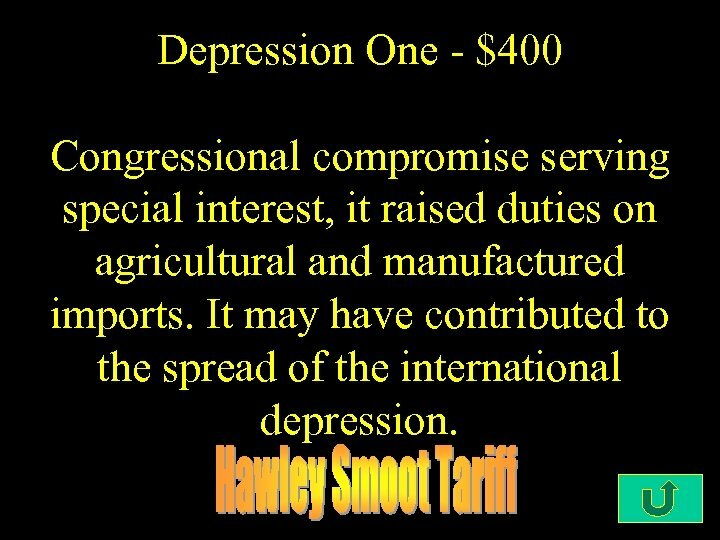 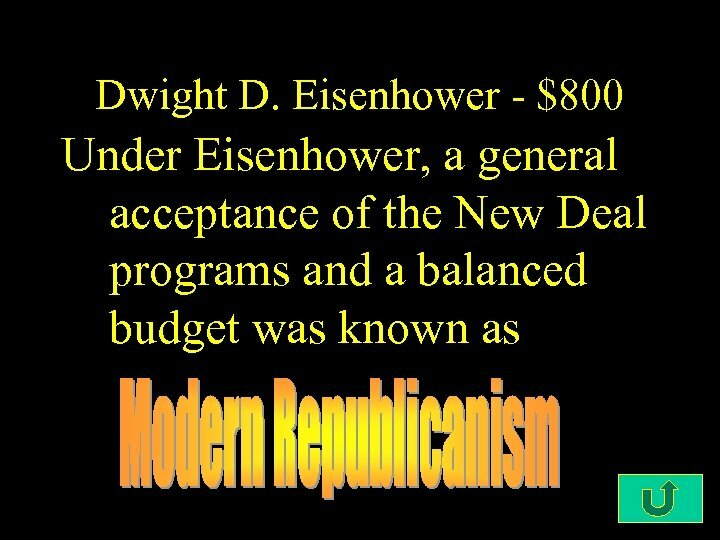 Depression One - $400 Congressional compromise serving special interest, it raised duties on agricultural and manufactured imports. 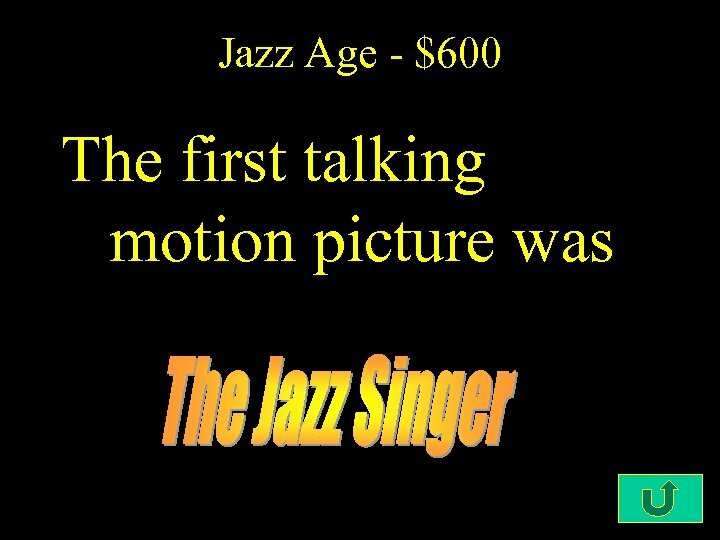 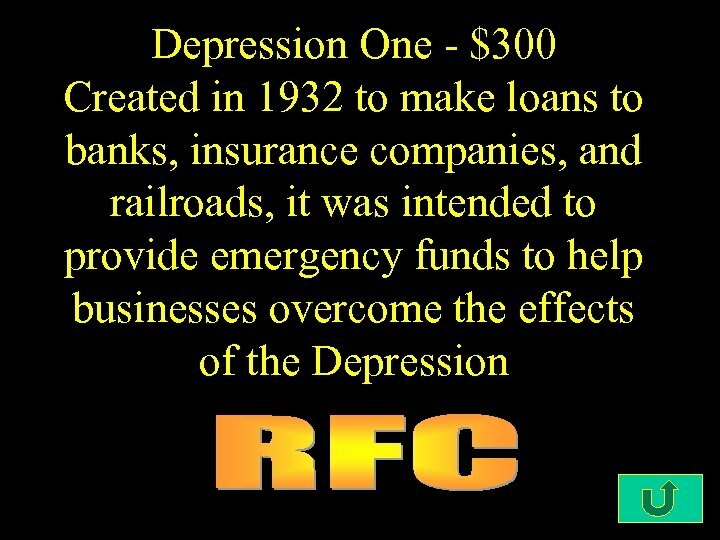 It may have contributed to the spread of the international depression. 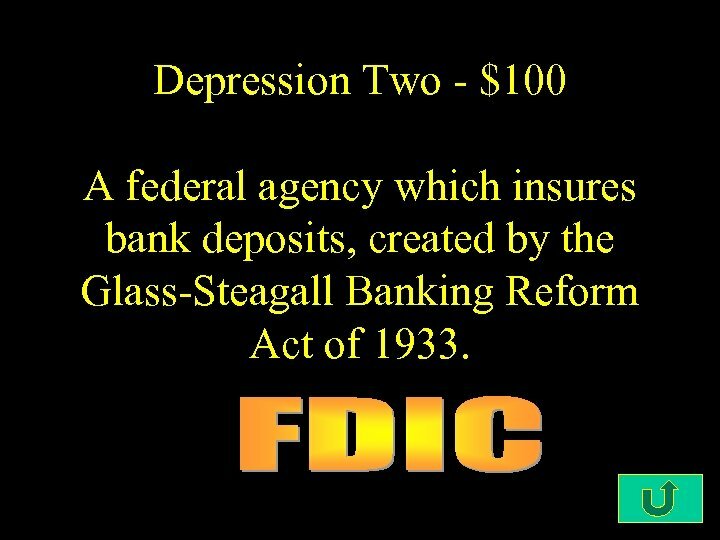 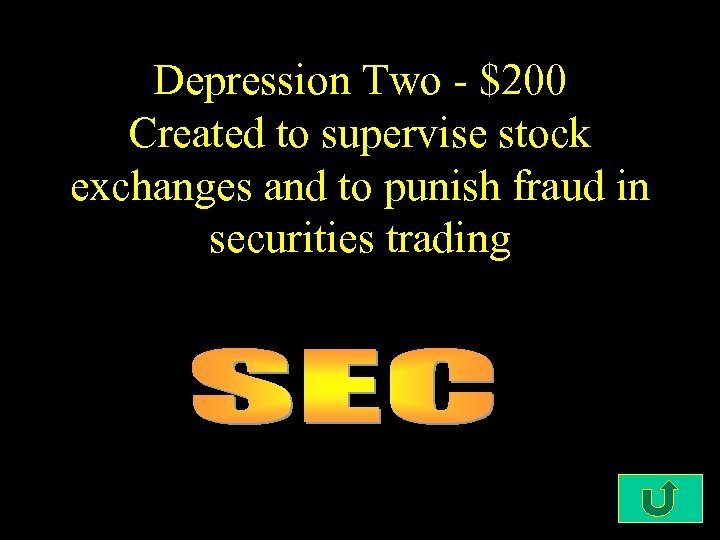 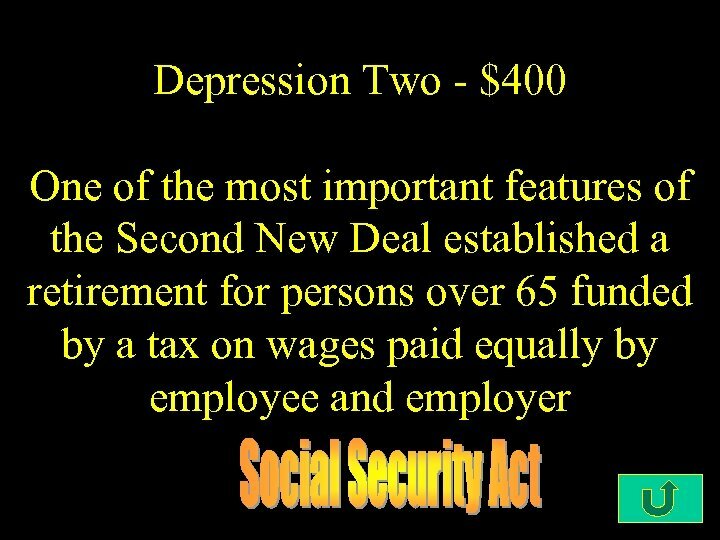 Depression Two - $100 A federal agency which insures bank deposits, created by the Glass-Steagall Banking Reform Act of 1933. 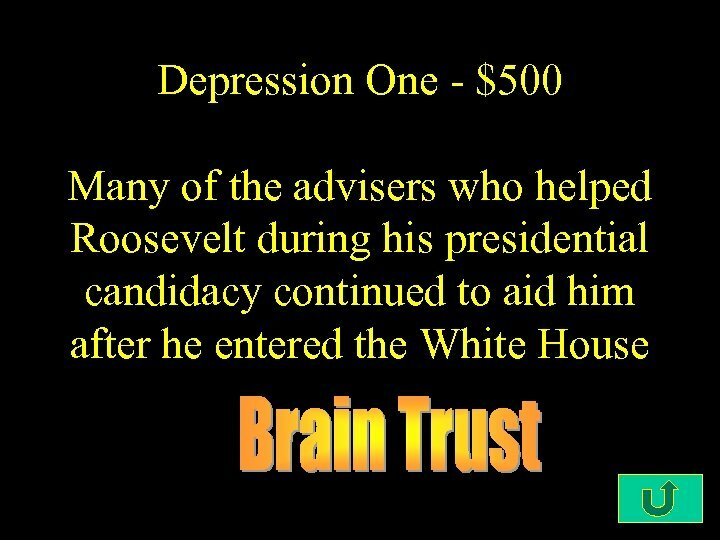 Depression Two - $300 It offered contracts to farmers to reduce their output of designated products. 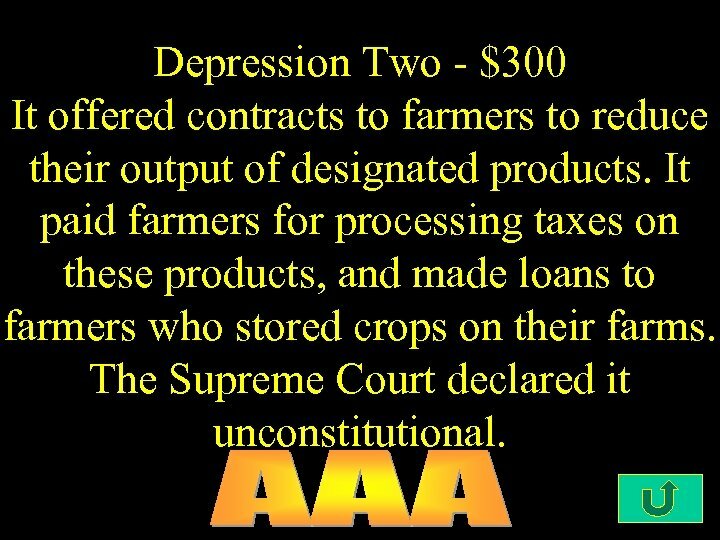 It paid farmers for processing taxes on these products, and made loans to farmers who stored crops on their farms. 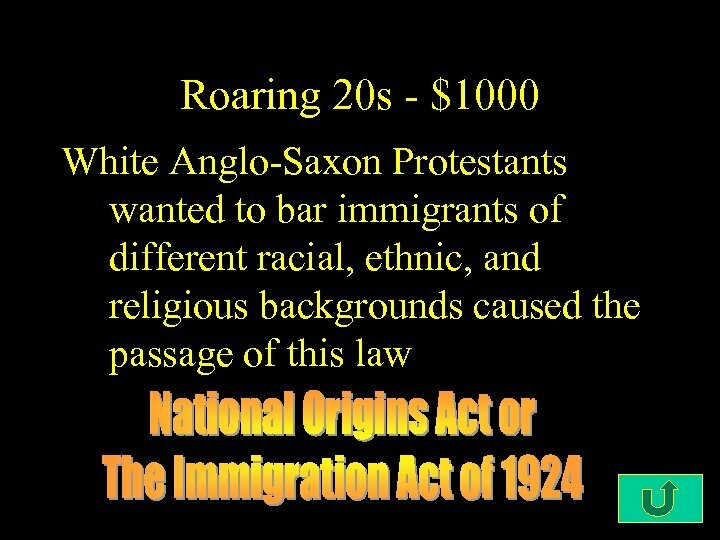 The Supreme Court declared it unconstitutional. 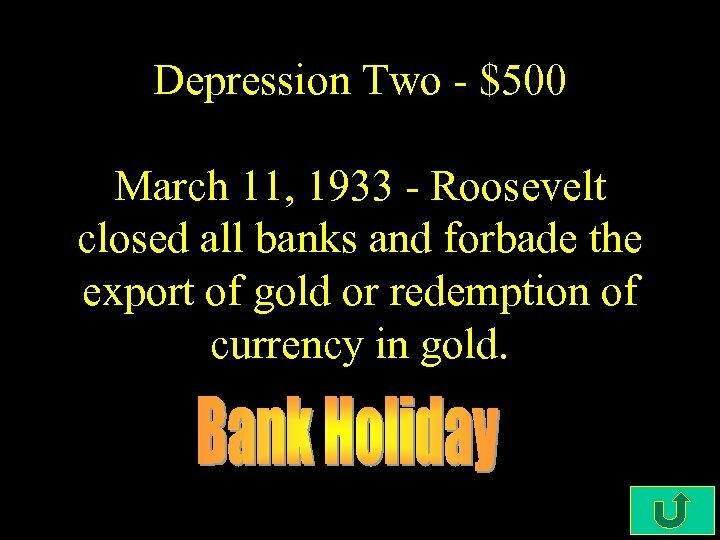 Depression Two - $500 March 11, 1933 - Roosevelt closed all banks and forbade the export of gold or redemption of currency in gold. 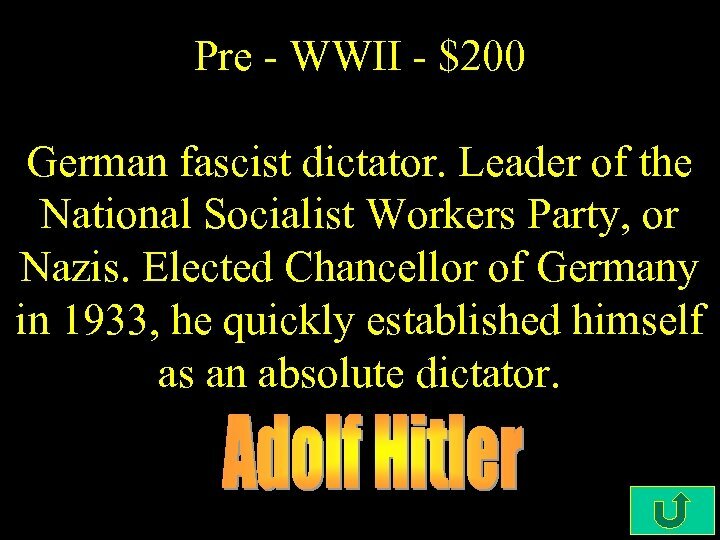 Pre - WWII - $200 German fascist dictator. 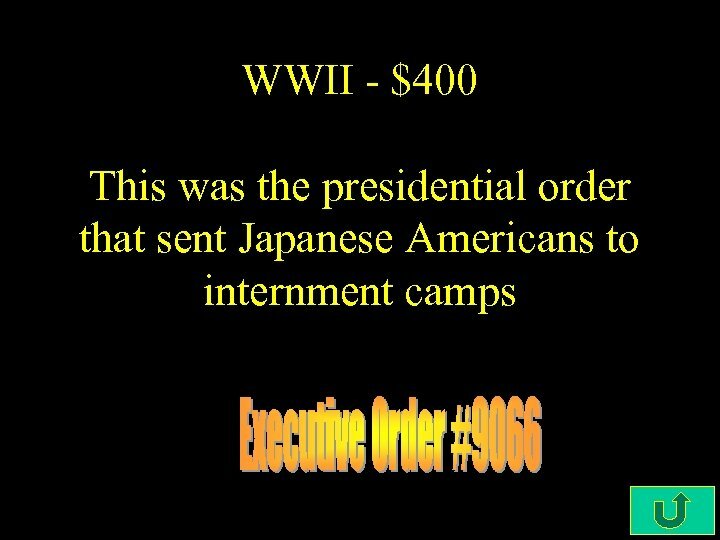 Leader of the National Socialist Workers Party, or Nazis. 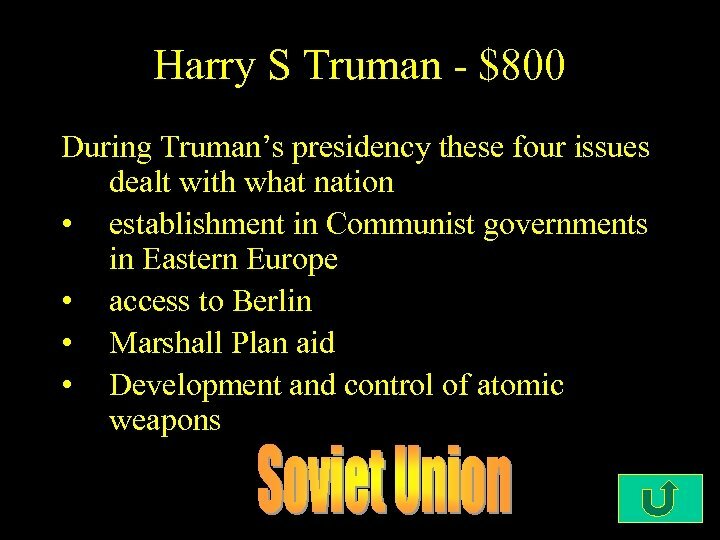 Elected Chancellor of Germany in 1933, he quickly established himself as an absolute dictator. 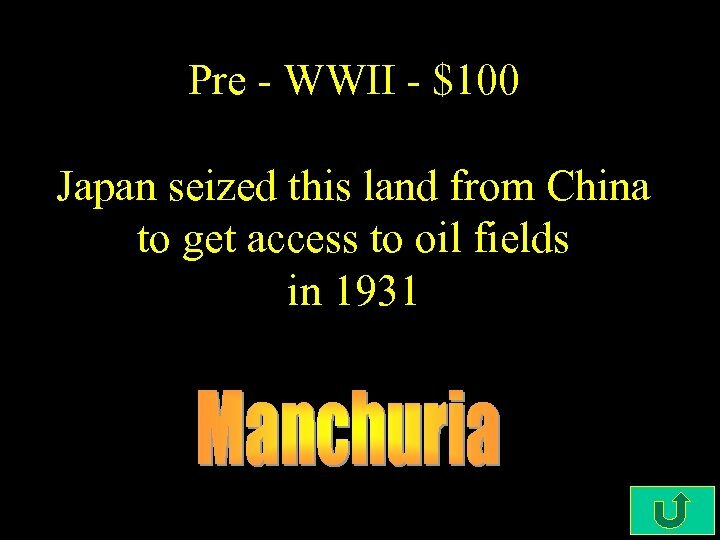 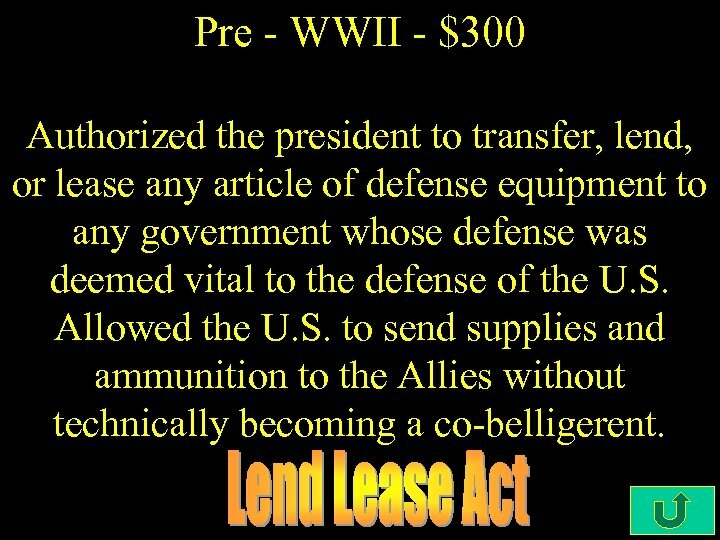 Pre - WWII - $300 Authorized the president to transfer, lend, or lease any article of defense equipment to any government whose defense was deemed vital to the defense of the U. S. Allowed the U. S. to send supplies and ammunition to the Allies without technically becoming a co-belligerent. 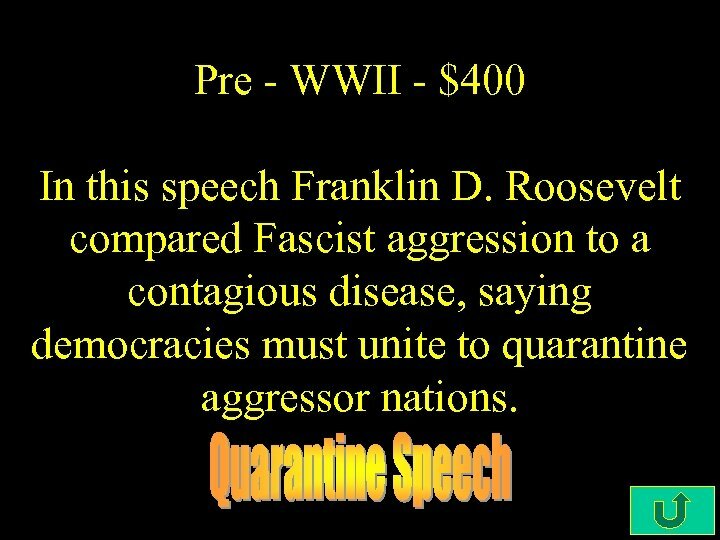 Pre - WWII - $400 In this speech Franklin D. Roosevelt compared Fascist aggression to a contagious disease, saying democracies must unite to quarantine aggressor nations. 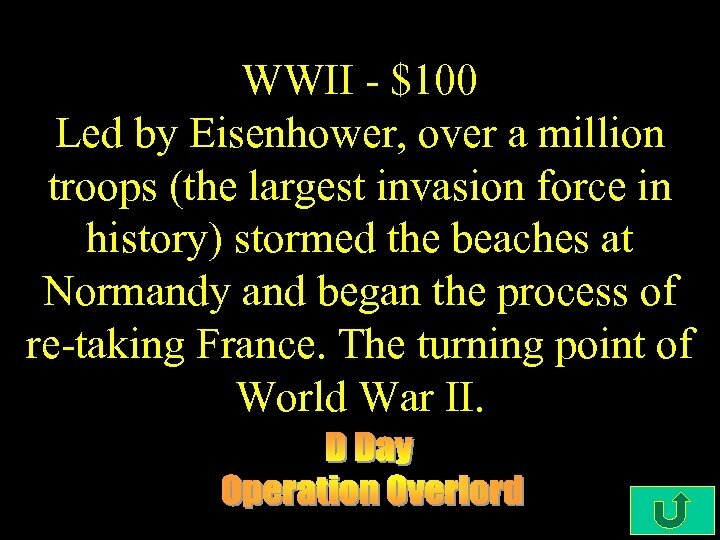 WWII - $100 Led by Eisenhower, over a million troops (the largest invasion force in history) stormed the beaches at Normandy and began the process of re-taking France. 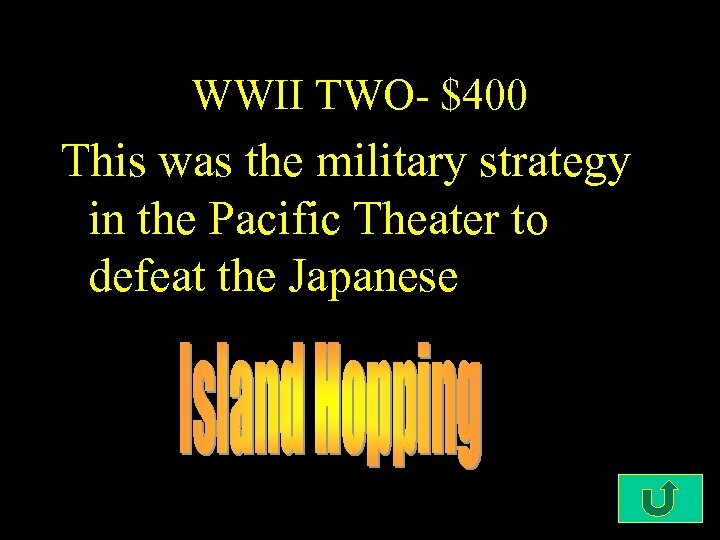 The turning point of World War II. 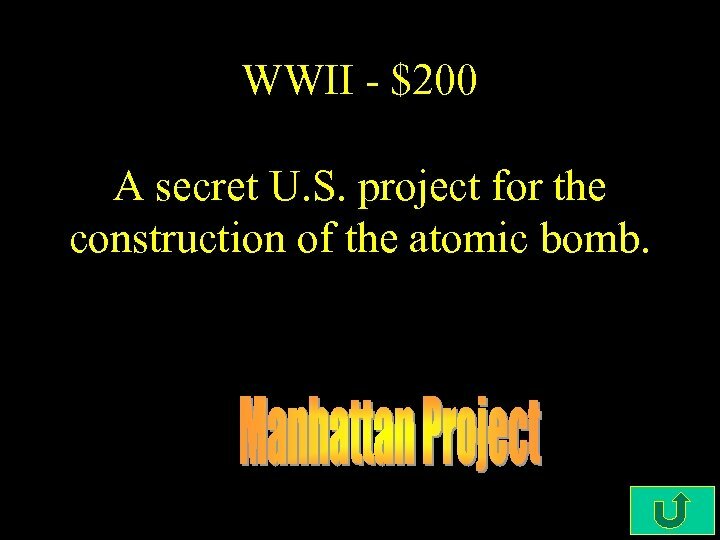 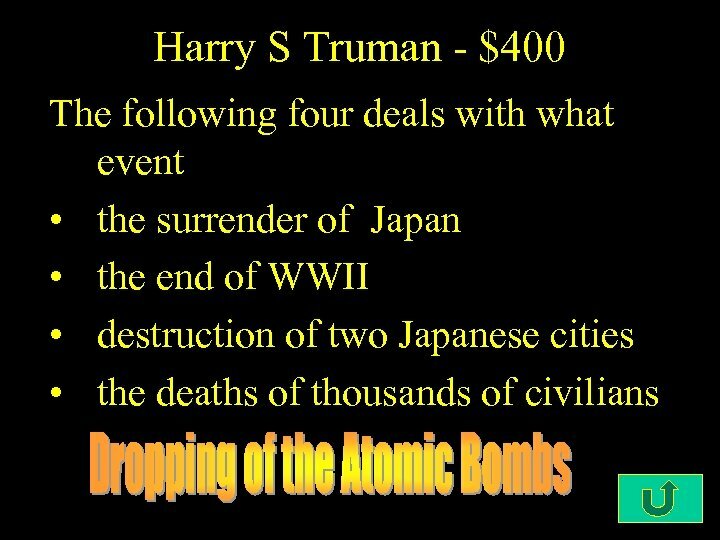 WWII - $200 A secret U. S. project for the construction of the atomic bomb. 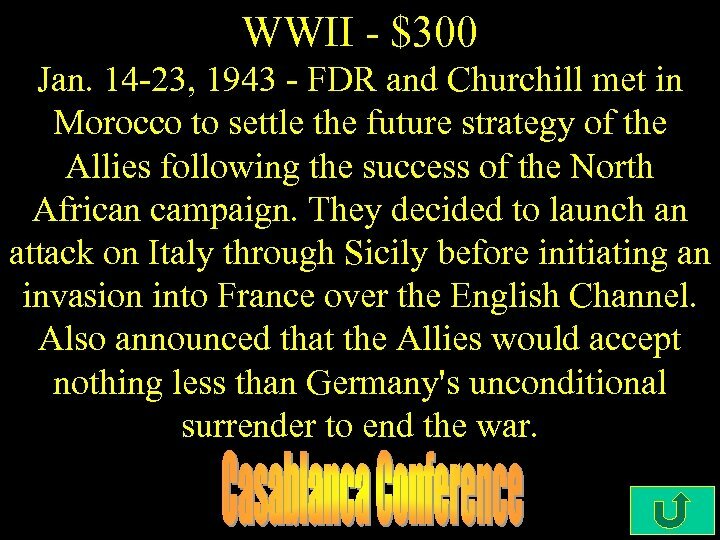 WWII - $300 Jan. 14 -23, 1943 - FDR and Churchill met in Morocco to settle the future strategy of the Allies following the success of the North African campaign. 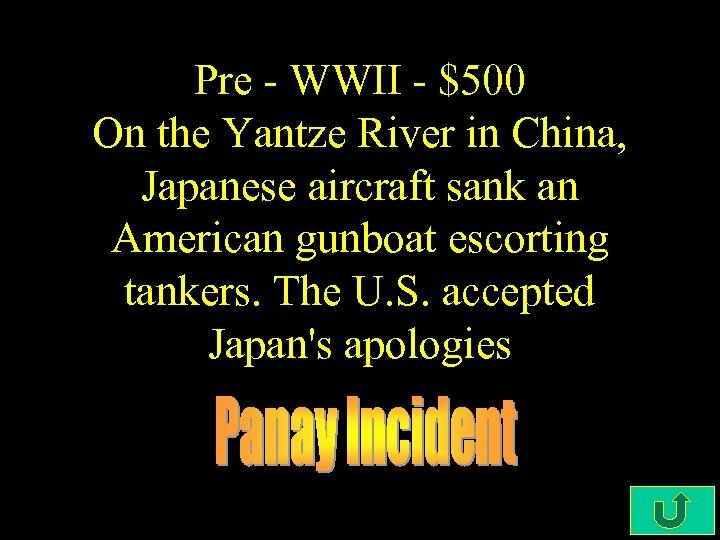 They decided to launch an attack on Italy through Sicily before initiating an invasion into France over the English Channel. 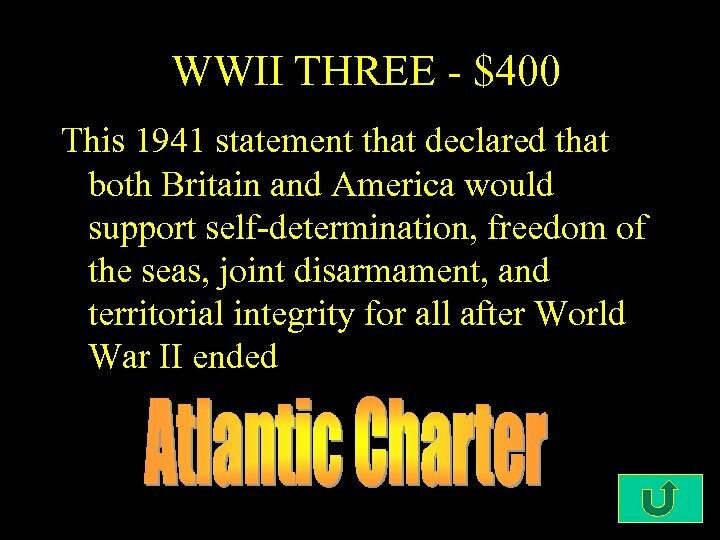 Also announced that the Allies would accept nothing less than Germany's unconditional surrender to end the war. 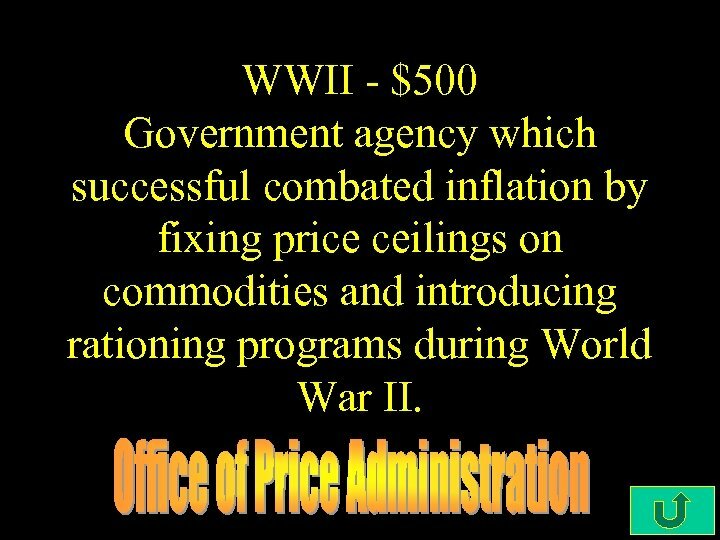 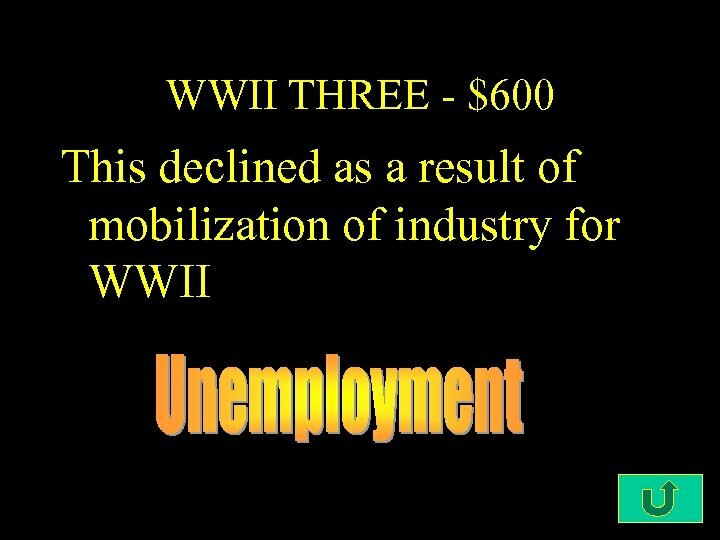 WWII - $500 Government agency which successful combated inflation by fixing price ceilings on commodities and introducing rationing programs during World War II. 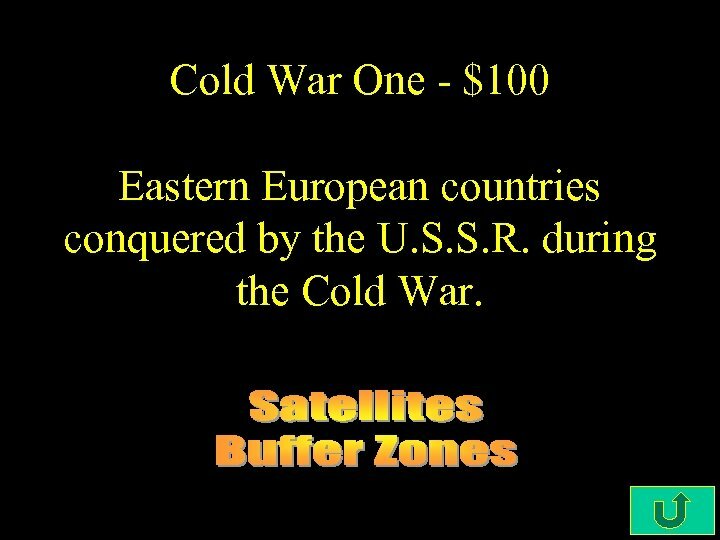 Cold War One - $100 Eastern European countries conquered by the U. S. S. R. during the Cold War. 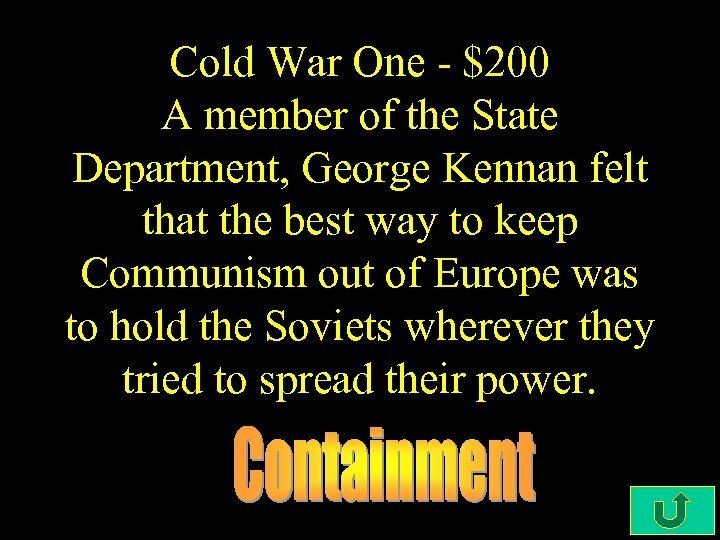 Cold War One - $200 A member of the State Department, George Kennan felt that the best way to keep Communism out of Europe was to hold the Soviets wherever they tried to spread their power. 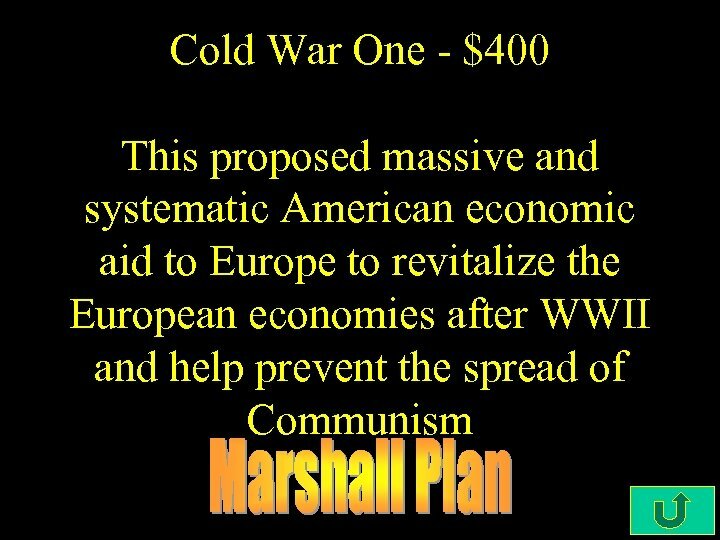 Cold War One - $500 Chartered April, 1949. 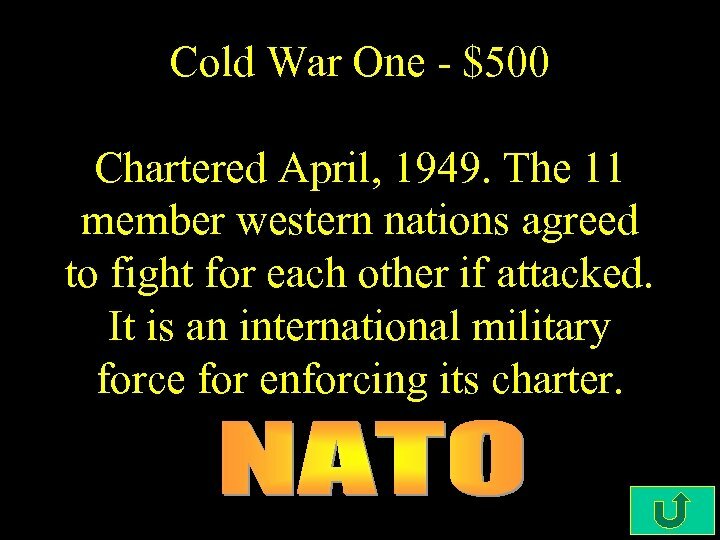 The 11 member western nations agreed to fight for each other if attacked. 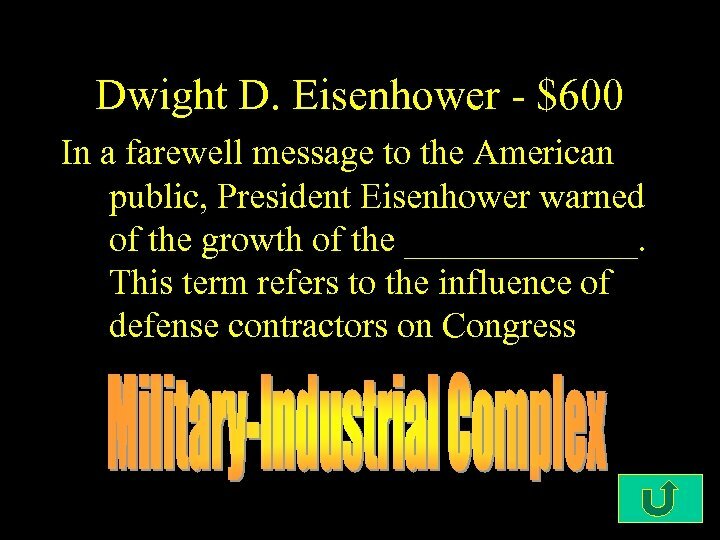 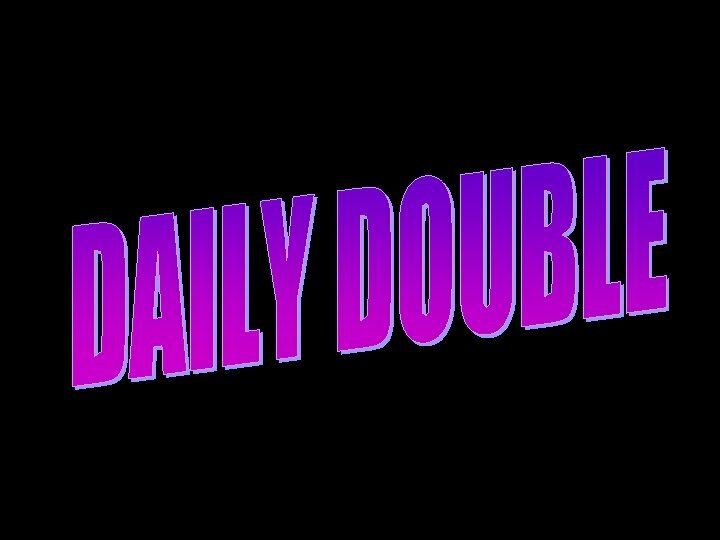 It is an international military force for enforcing its charter. 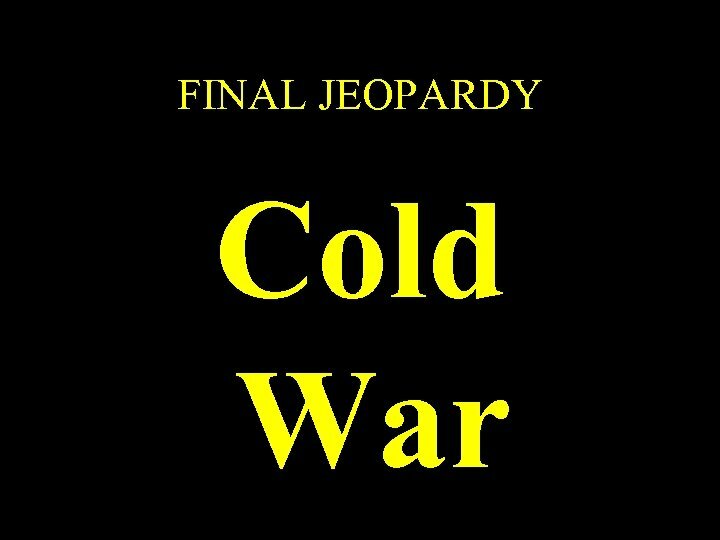 Cold War Two- $200 To counter the NATO buildup, the Soviets formed this military organization with the nations of Eastern Europe. 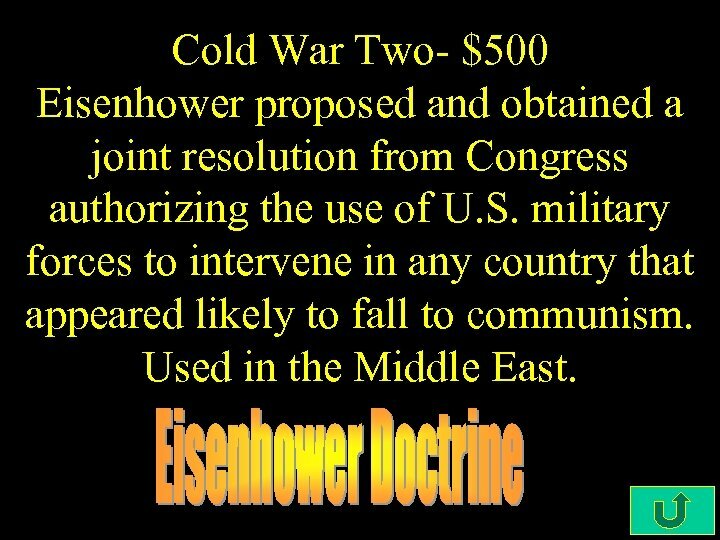 Also gave Russia an excuse for garrisoning troops in these countries. 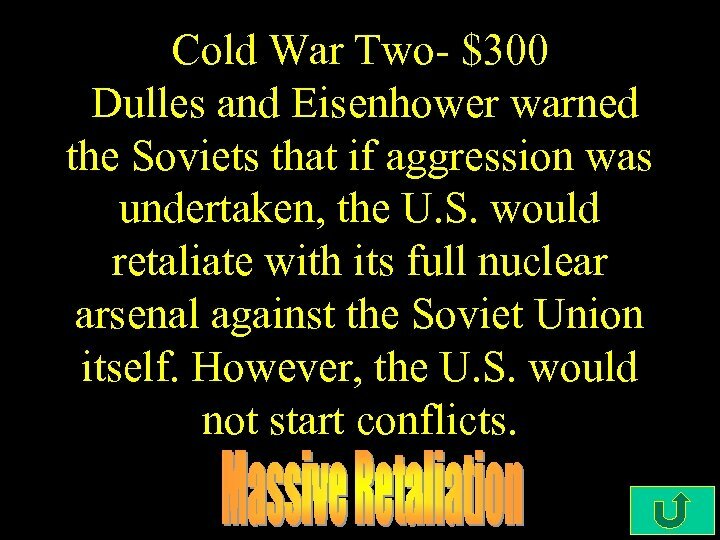 Cold War Two- $300 Dulles and Eisenhower warned the Soviets that if aggression was undertaken, the U. S. would retaliate with its full nuclear arsenal against the Soviet Union itself. 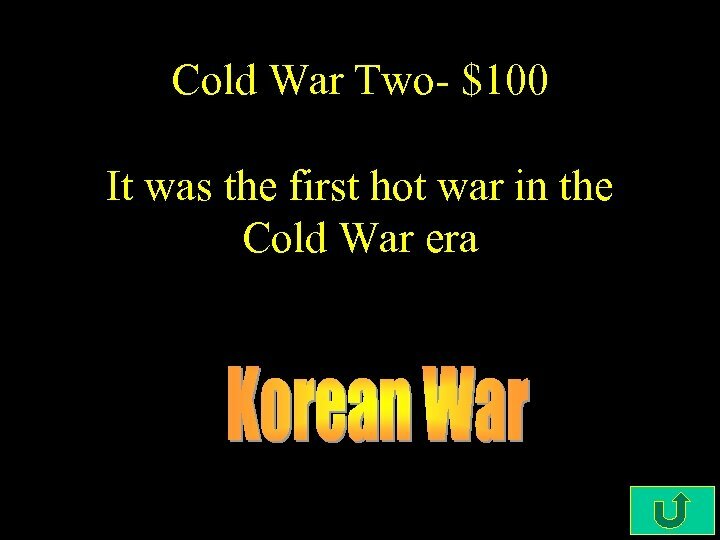 However, the U. S. would not start conflicts. 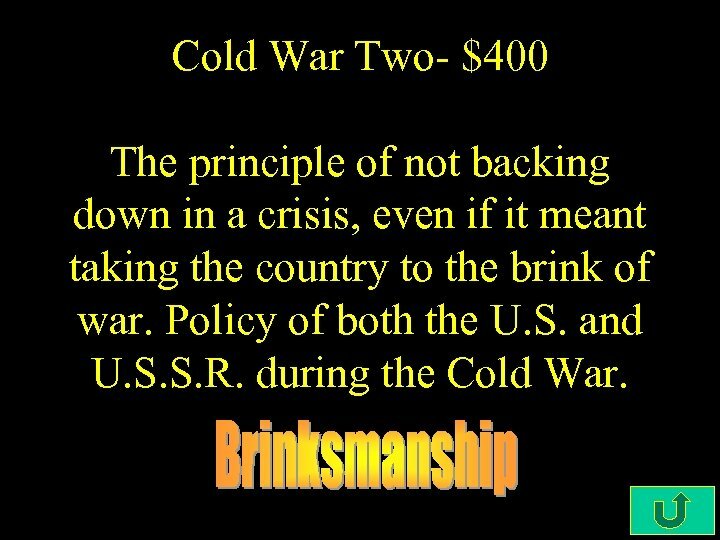 Cold War Two- $400 The principle of not backing down in a crisis, even if it meant taking the country to the brink of war. 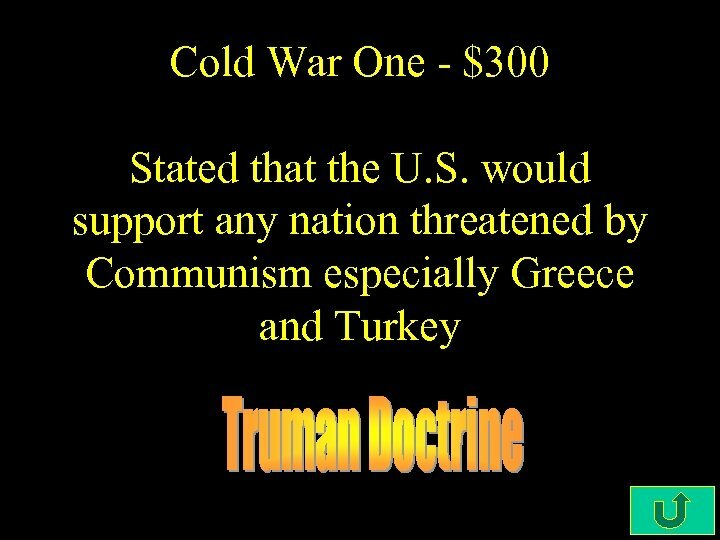 Policy of both the U. S. and U. S. S. R. during the Cold War. 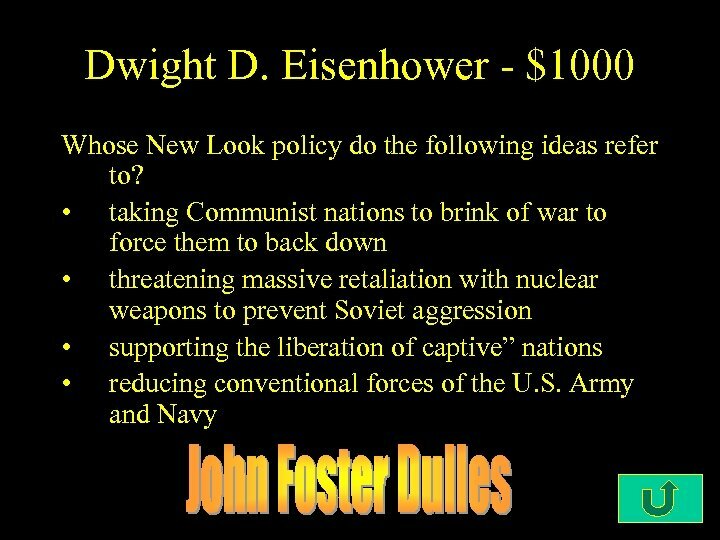 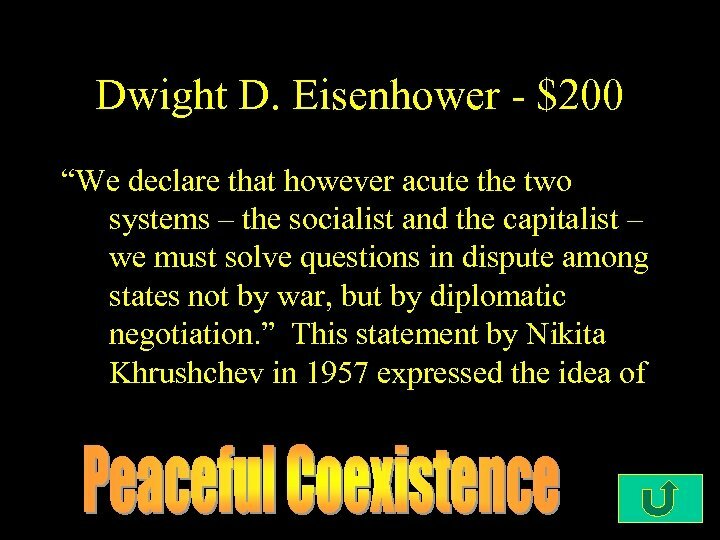 Cold War Two- $500 Eisenhower proposed and obtained a joint resolution from Congress authorizing the use of U. S. military forces to intervene in any country that appeared likely to fall to communism. 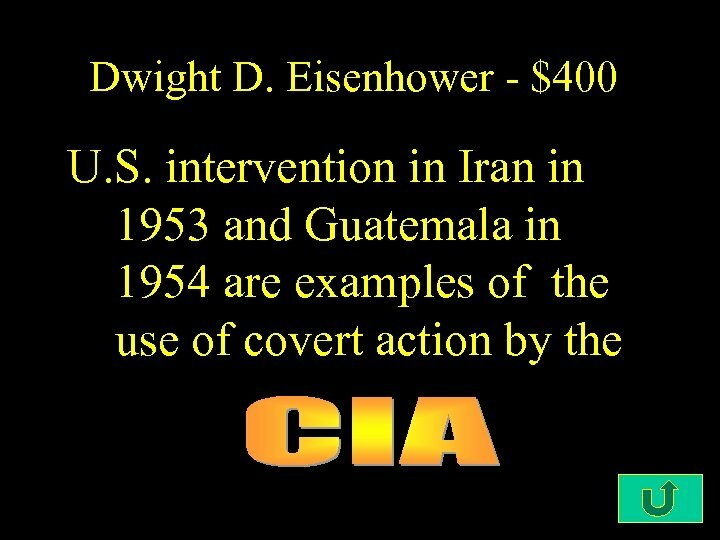 Used in the Middle East. 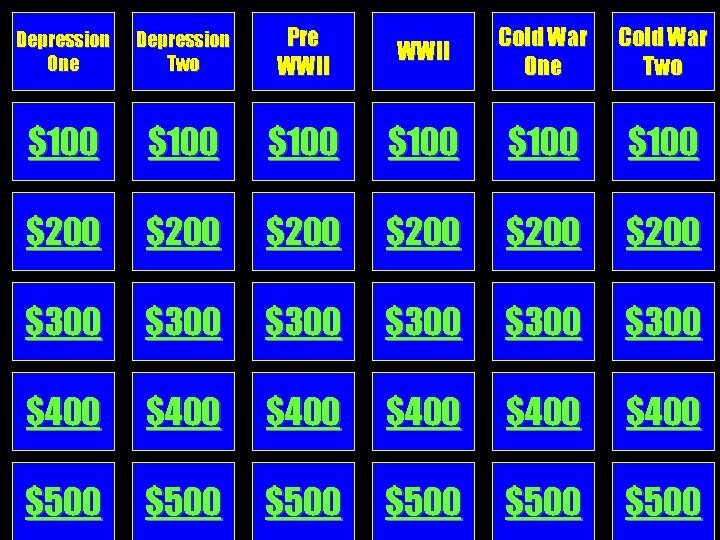 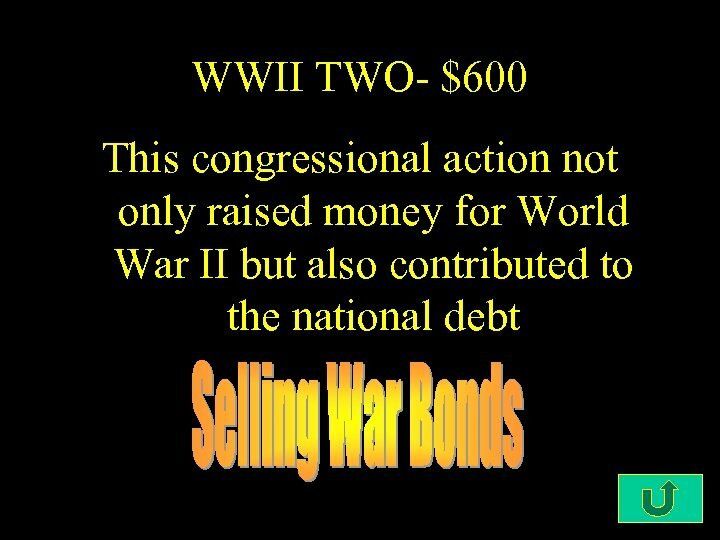 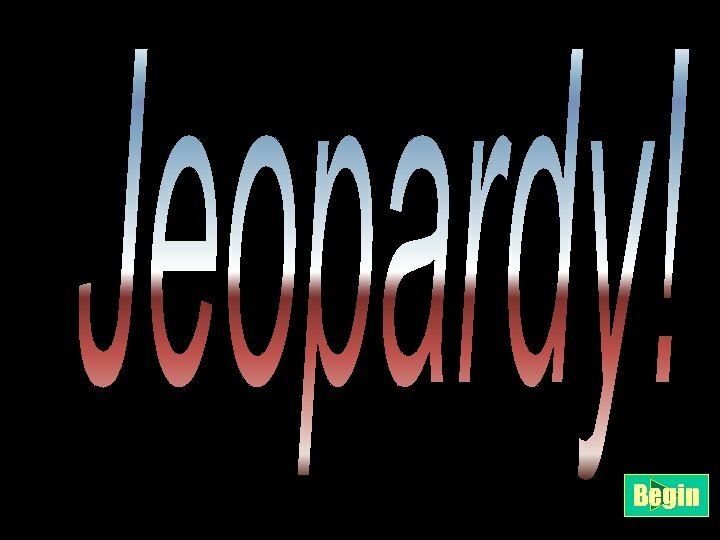 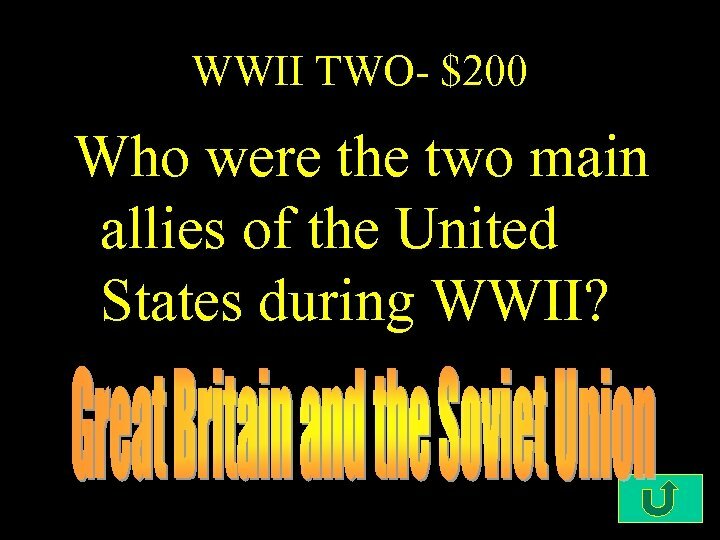 WWII TWO- $200 Who were the two main allies of the United States during WWII? 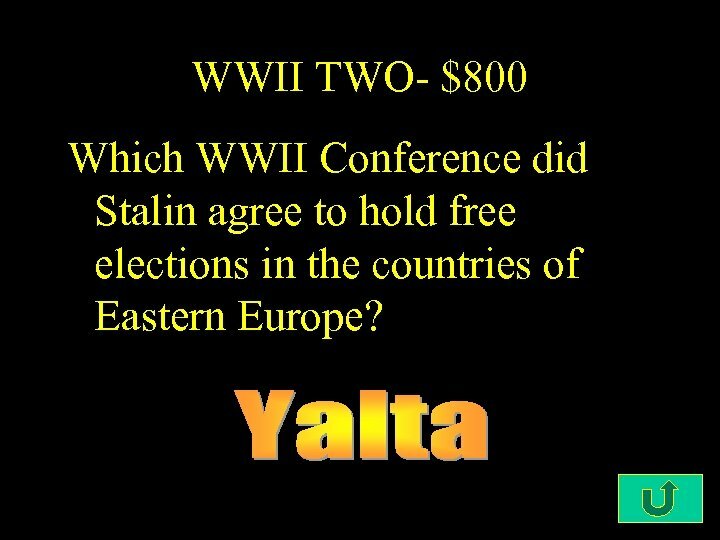 WWII TWO- $800 Which WWII Conference did Stalin agree to hold free elections in the countries of Eastern Europe? 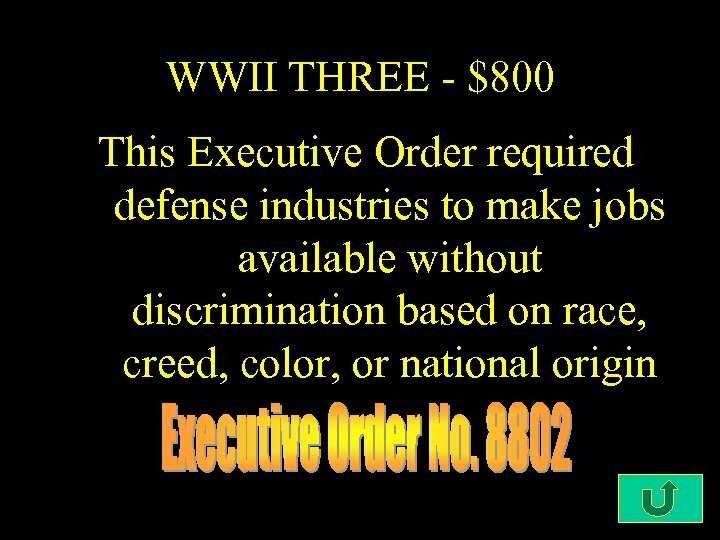 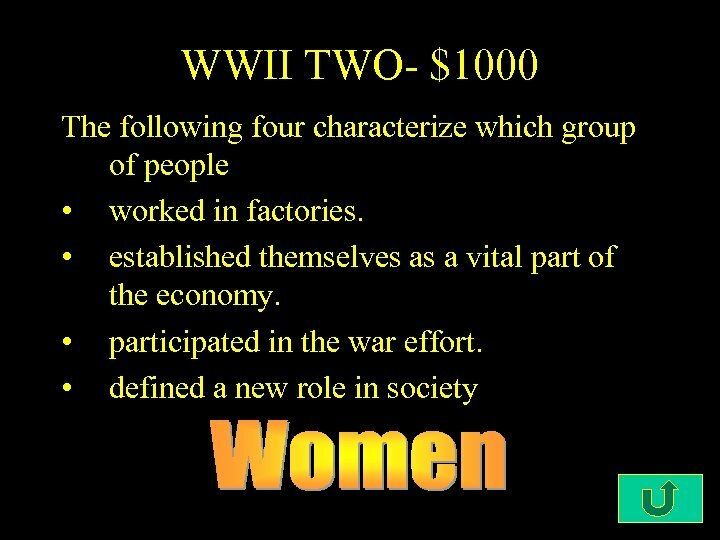 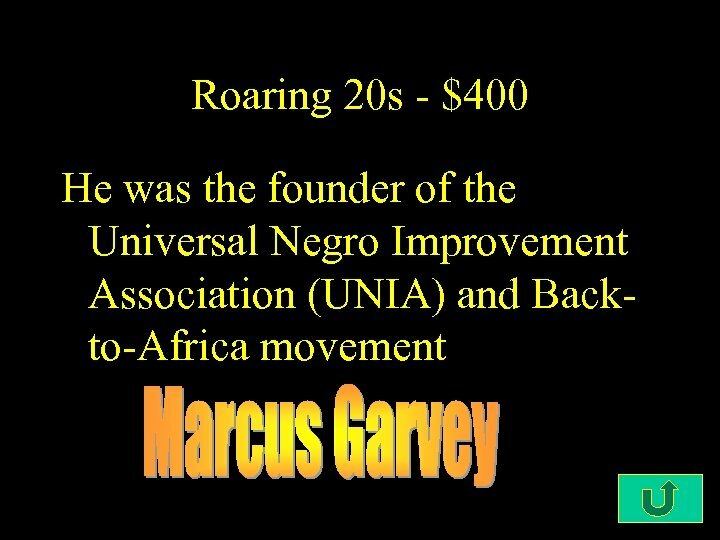 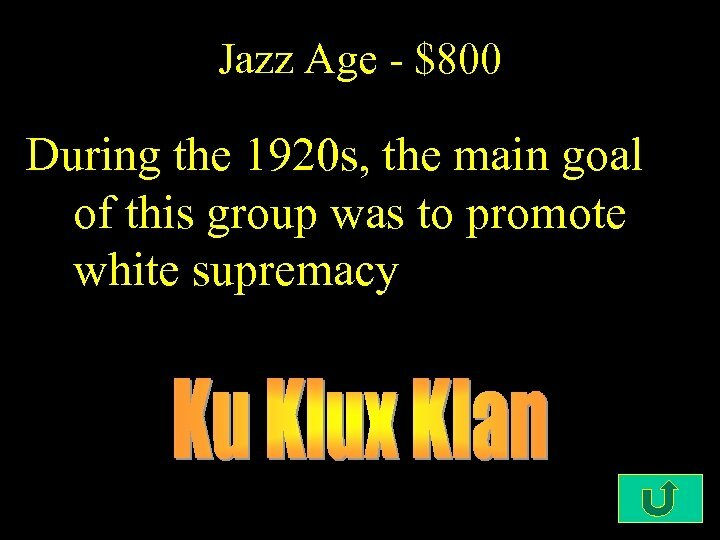 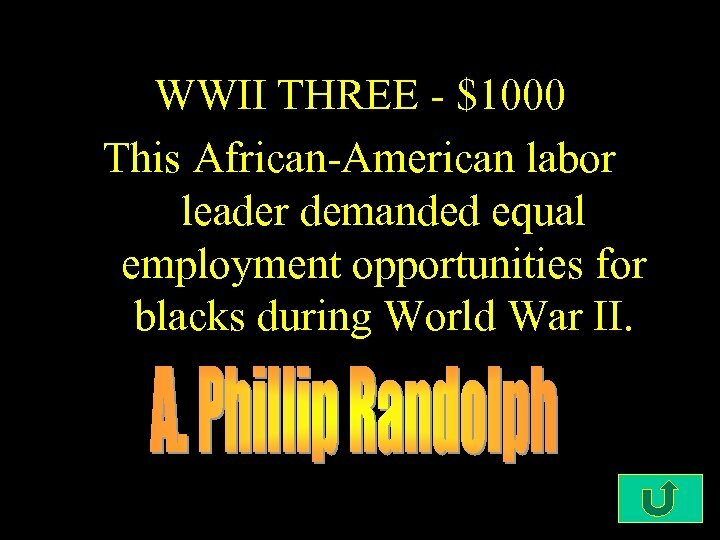 WWII THREE - $1000 This African-American labor leader demanded equal employment opportunities for blacks during World War II. 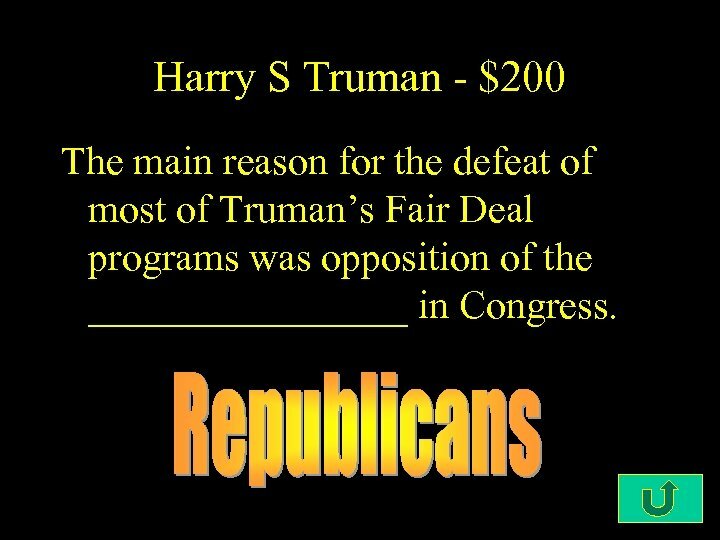 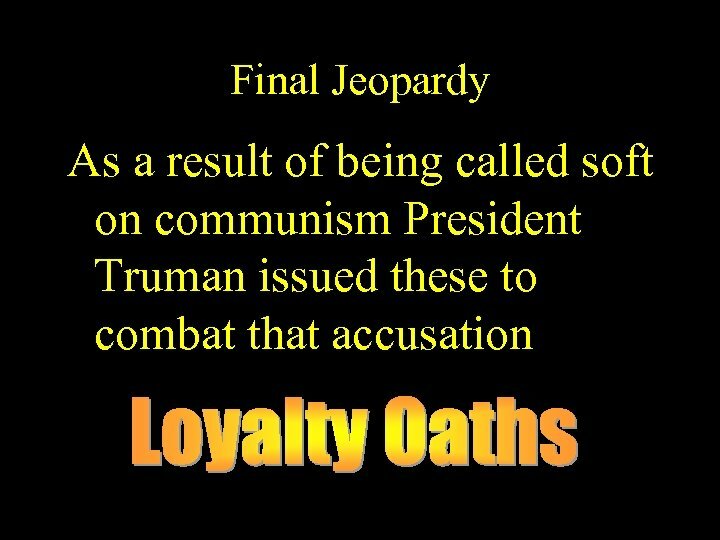 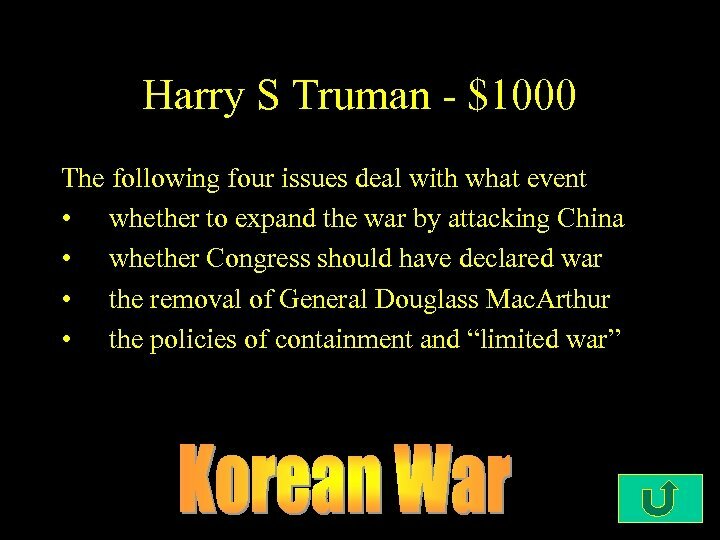 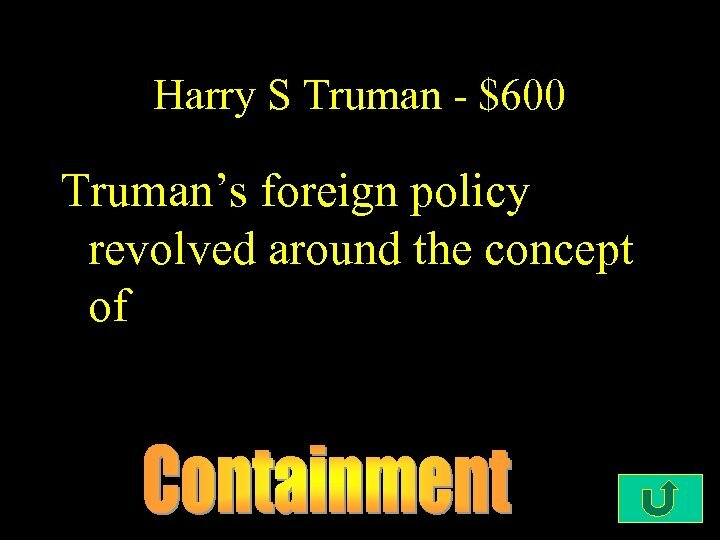 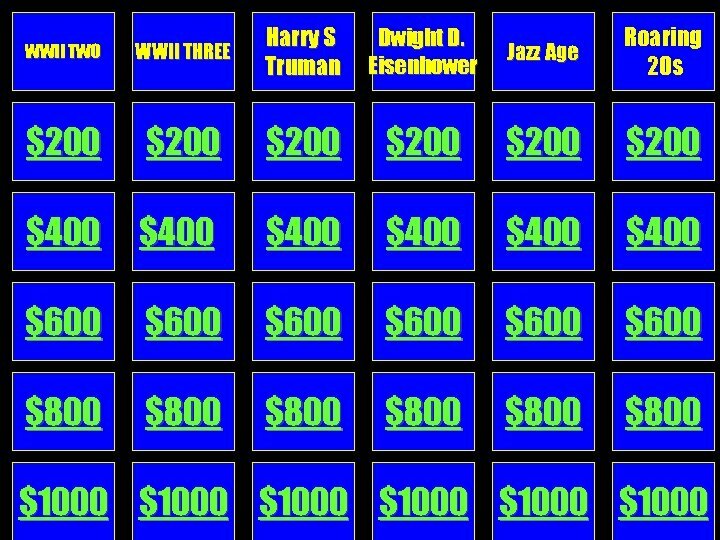 Harry S Truman - $200 The main reason for the defeat of most of Truman’s Fair Deal programs was opposition of the ________ in Congress. 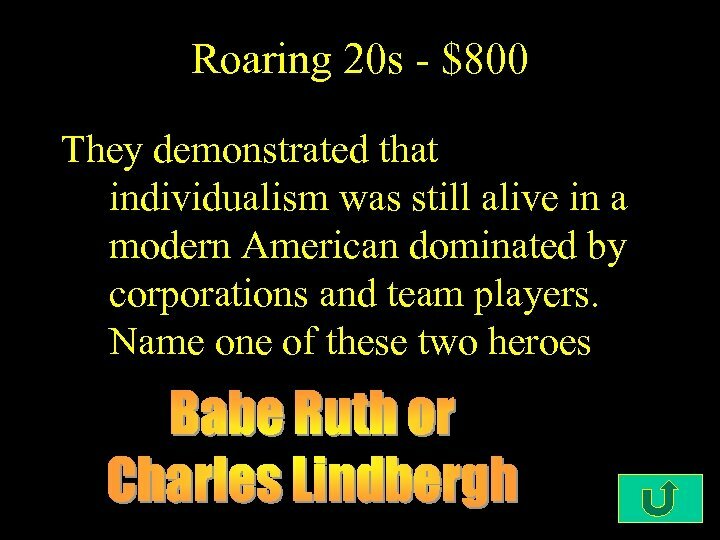 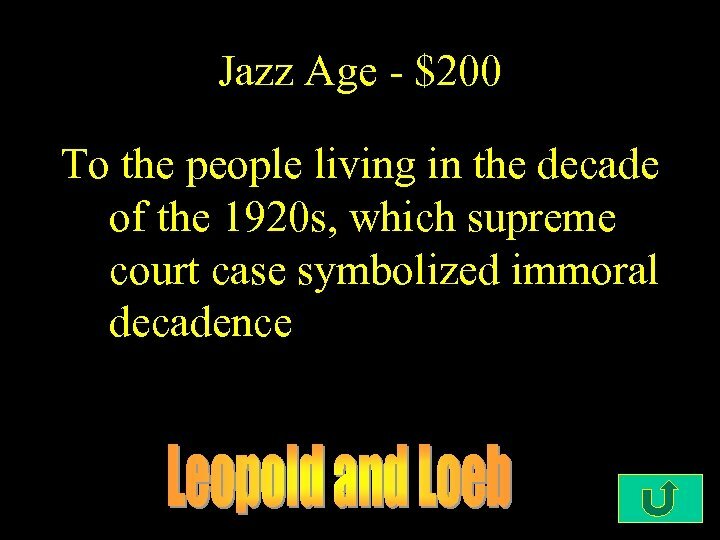 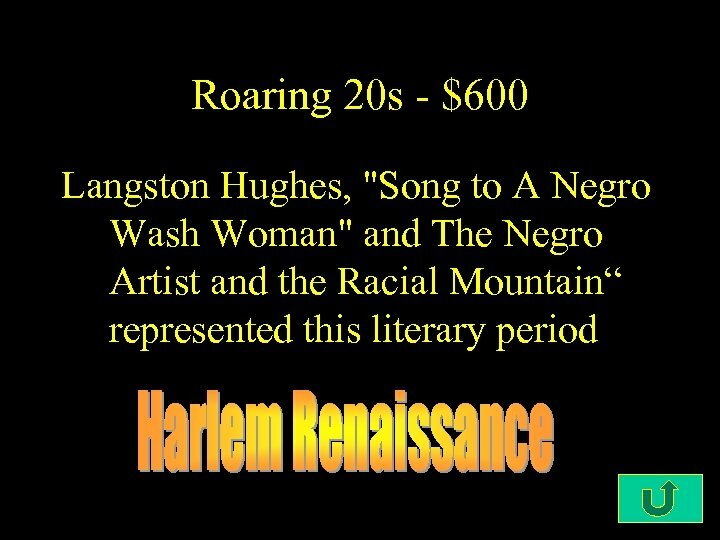 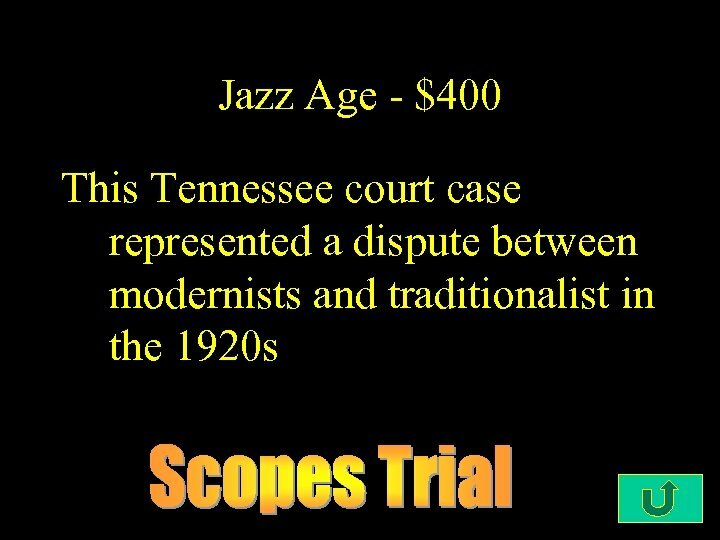 Roaring 20 s - $200 In 1919, the Communist Party was gaining strength in the U. S. , and Americans feared Communism. 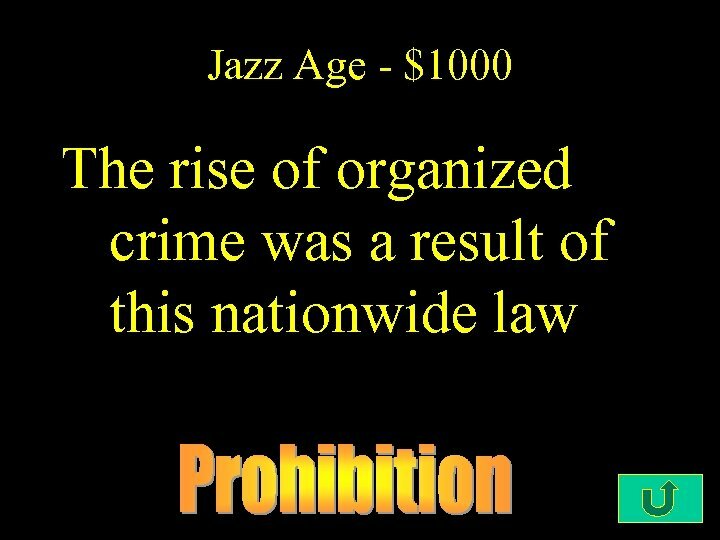 In January, 1920, Palmer raids in 33 cities broke into meeting halls and homes without warrants. 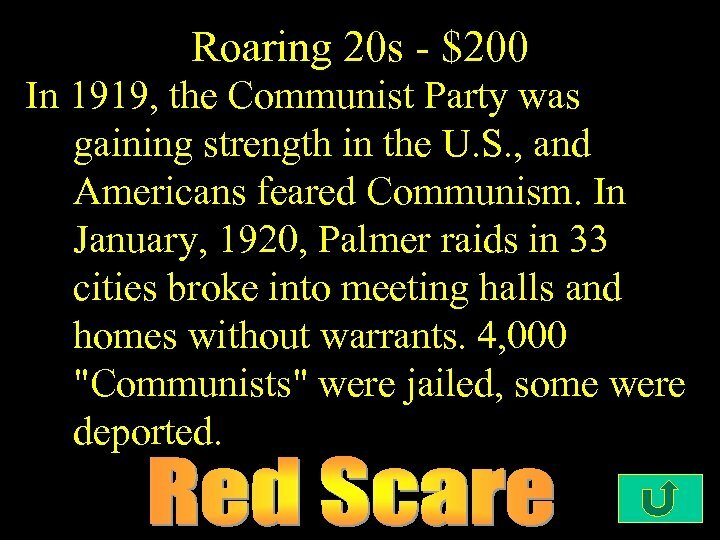 4, 000 "Communists" were jailed, some were deported.